The fateful events of May 1996 have long been in the thoughts of climbers and mountaineers ever since. Here they receive the big budget Hollywood treatment, and for the most part it's a well done retelling of those events. To his credit director Baltasar Kormákur took his cast and crew to the mountain to experience the elements during the shooting of this film. It successfully captures those elements in ways that feel genuine. At least as genuine as we general audience members can imagine. 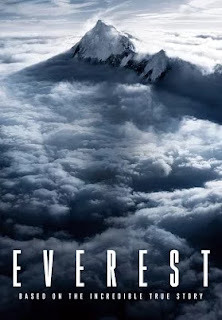 The film follows intrepid mountaineer Rob Hall (Jason Clarke) as he leads a large group of high paying clients on a an ill-fated climb up the treacherous summit of Mount Everest. Before he leaves he says goodbye to his pregnant wife in the most Hollywood moment the film has to offer. His clients include among others: rich Texan Beck Weathers (Josh Brolin), writer Jon Krakauer (Michael Kelly), mailman Doug Hansen (John Hawkes), whose presence on such an expensive journey signifies how decent a man Hall truly was, and experienced Japanese mountain climber Yasuko Namba (Naoko Mori) intent on completing her journey of climbing the 7 summits (Everest being the last one remaining). While Hall is the sympathetic center of the film, Weathers and Hanson are given the next most time in terms of character establishing, while Krakauer and Namba feel somewhat left out, but then again that decision relates directly to how much they factor in to later events. The climb and its dangers are established in brief snippets while establishing the cast of climbers. It's brief but feels adequate. We also meet the other guides leading other groups up Everest at the same time. The most notable of which is American Scott Fischer (Jake Gyllenhaal) who agrees to team up with Rob and his group considering the bottleneck found at certain points of the route caused by the numerous commercial groups attempting the climb on the same days. These many commercial groups not working together and planning excursions at the same time are cast as part of the problem, but maybe not the main problem. For the most part I respect the script by William Nicholson and Simon Beaufoy for avoiding a common trend in Hollywood films based on true stories. They don't let standard Hollywood elements confuse or alter the facts of the story they're presenting. Despite the fact that Rob Hall (of Adventure Consultants) and Scott Fischer (of Mountain Madness) were competitors, no one is cast as the bad guy in order to make us root for the good guy more, and it avoids attempts at unnecessary action sequences. These events were dramatic enough as they were. Thankfully the writers knew they didn't need embellishment. Yet the issue here is that it's ambitions stopped at telling the basic facts. Little of the film is devoted to the driving force that pits man against nature and placed these people where humans were clearly not meant to be. Several books have been written about these events. Krakauer, being present for the climb, wrote the book Into Thin Air: A Personal Account of the Mt. Everest Disaster in which he explains how a "rogue storm" caused the deaths of 8 climbers. He also leveled criticism against the commercialization of climbing Everest, and the actions of Scott Fischer's guide Anatoli Boukreev, who wrote his own account of the events as a rebuttal to Krakauer's book in The Climb. "Everest" the film, has nothing to say about either of these people or their claims. It remains neutral. A teller of facts as they happened, or at least as we know them, and nothing more. Some decisions made were clearly reckless, yet the human mind operating with too little oxygen has hardly the ability to properly assess risks. They also know how hard they've worked and how far they've come and how much money they've paid. In such instances it's hard to be the voice of reason telling them "no" when they say they can keep going. Especially when their destination is within sight. "Everest" and the events of that day are a cautionary tale about hard earned lessons learned too late. Nature has plans of its own, and humans inability to respect it leads to far too many deaths. It's a sobering tale that conquering nature is a fools errand, and certainly not one to be made commercially viable. It is a task only for the bravest and most physically fit humanity has to offer. The presence of oxygen tanks and professional guides should not be a green light for the moderately capable. While "Everest" shows this with strong performances from a collection of recognizable stars and beautiful cinematography, it doesn't make itself much of a commentary on these issues. For some that'll be the thing its missing, for others it'll be a shrewd move to keep from feeling preachy. No matter which camp you fall in, as a cinema going experience, it's a well told and thrilling retelling of this disaster. While the 3D version isn't worth the extra price, it would certainly be worth seeing in IMAX if you get the chance. Much of the story here is told as a side story within the documentary of another group of climbers in the 1998 made for IMAX documentary, also titled "Everest." It's only 45 minutes long, available on Netflix, and certainly worth the time if you're interested in a double feature.